In choosing which type of denture to have, people tend to skip considering Implant Dentures. Usually, the predominant reason would be the upfront cost of getting implant-supported dentures. Then again, these modern types of dentures can provide you with a number of advantages that can definitely make the cost worth it. 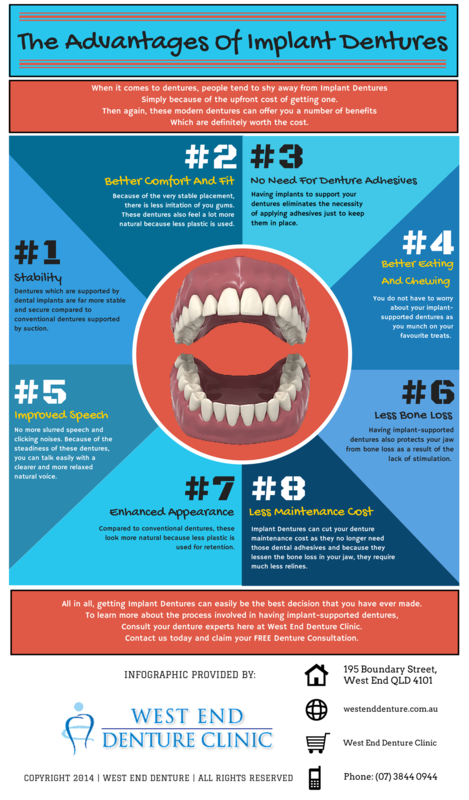 Before you count Implant Dentures out of your options, consider these benefits first. Compared to conventional dentures, implant-supported dentures are far more stable. As a result, they can give you better comfort and fit. You do not have to worry about your dentures as you eat, chew, speak, smile, or laugh. In addition, they look and feel more closely to your natural teeth because there is less plastic used in order to retain them in their placement. Also, Implant Dentures can help preserve the youthful appearance of your face by protecting your jaw from bone loss. It is important to note that there are certain requirements for you to be a good candidate for having dental implants. 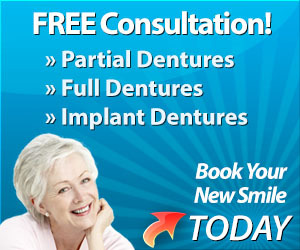 To learn more about Implant Dentures, consult your denture experts here at West End Denture Clinic. Using the latest techniques, we can provide you with high-quality implant-supported dentures and other types of dentures that would fit your needs. Call us today on (07) 3844 0944 or simply book your appointment online.